In the contiguous United States, this tropical seabird can be found nesting only in the Dry Tortugas National Park. Since the early 1980s up to six pairs of this beautiful seabird have nested annually in the park. They typically lay two white eggs in a scrape on the ground but they almost always only raise one chick successfully. During storms Masked Boobies have been spotted in other parts of the state but to see them reliably you should visit the Tortugas in April and May. They spend most of their entire life at sea and only visit land to nest. 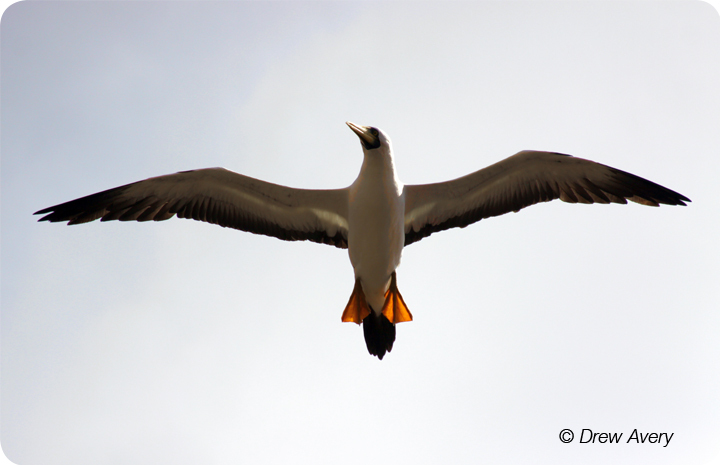 Boobies feed on fish and squid, which they catch by plunge-diving into the water from heights up to 100 feet. Masked Booby is one of six species of booby. They were named ‘bobo’ by Spanish explorers, a derogatory word meaning stupid. They got this name because of their tameness and habit of landing on ships, which made them easy to capture for the dinner table!